The new drinking fountain in London's Hyde Park - but will we get any more? Back in the day, outdoor drinking fountains were everywhere, they were vital for the wellbeing of the public and were often the only way to quench the thirst of the villages. They were often a very simple design, nothing too crazy, just a concrete slab with a hole for the water to come out of. Some parts of the world took pride in their drinking fountains and used them as a way to show off the design skills of their architects and artists in the region. France had some of the most glorious water fountains in the world. These days it seems as though public drinking water fountains are few and far between. 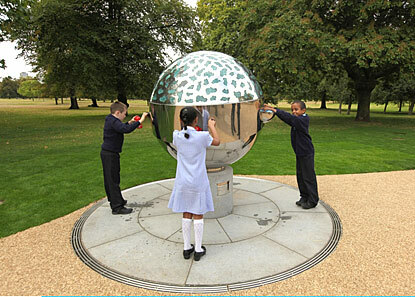 London’s Hyde Park has recently received a very fancy addition to its green landscape, a brand new water fountain shaped like a sphere designed so children and adults can easily reach the access points to the water. The fountain is the first one in the park for 30 years and was installed by instruction of Boris Johnson, but it appears the mayor has no more plans to install any more fountains in surrounding parks. Drinking Water Fountains is the UK’s specialist provider of water fountains. We were founded in January 2009 as a joint venture between The Water Cooler Company and Connect Pure – two of the UK’s leading water cooler providers to industry.If you would like any further information on outdoor drinking fountains please contact DrinkingWaterFountains.co.uk on 0845 500 4455 or email contact@drinkingwaterfountains.co.uk.